Do you have a leftover pumpkin on hand from Halloween or from pumpkin dishes (like this amazing Pumpkin Curry or Pumpkin Soup!)? Don’t toss the seeds! Let me show you how to roast them in this easy tutorial. And if you try the recipe, let us know how it goes! Leave a comment, rating, and don’t forget to tag a photo #minimalistbaker on Instagram. Cheers and happy baking, friends! 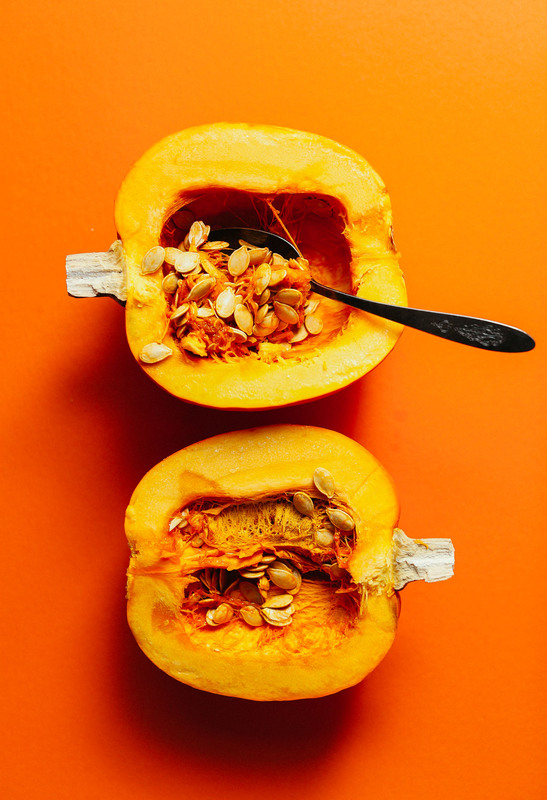 An easy, step-by-step tutorial for how to roast your own pumpkin seeds! Versatile with what seasonings you add, but crunchy and delicious every time. Preheat oven to 325 degrees F (162 C) and line a baking sheet with parchment paper (or more if making a larger batch). 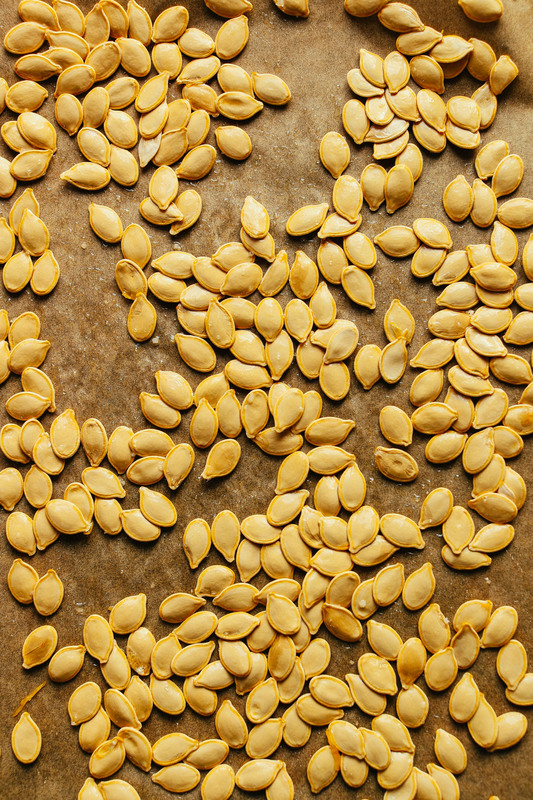 Arrange cleaned pumpkin seeds on a towel or paper towel and dry thoroughly. 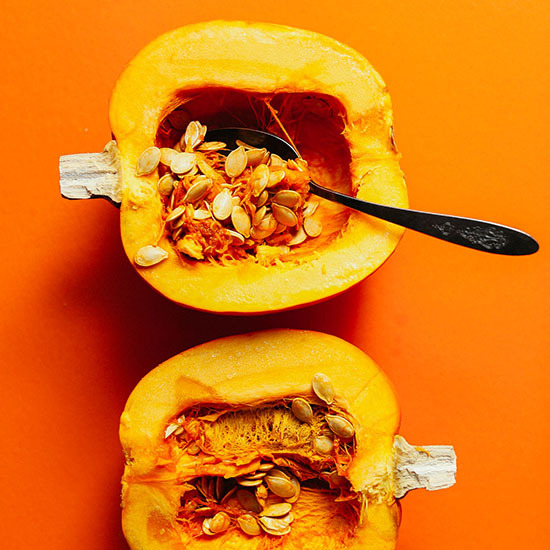 This will help the pumpkin seeds crisp up in the oven. Bake for 20-30 minutes (this will depend on how big your seeds are), or until crisp and light golden brown. Let cool completely before transferring to a sealed container, such as a mason jar. Will keep at room temperature for 1 week or more, or in the freezer up to 1 month. *Nutrition information is a rough estimate calculated with oil and salt. Hi, I followed recipe, although I dried the seeds overnight as they were very slimy. In the oven some of them started to pop. Out golden brown after 24 minutes but impossible to eat. When are you supposed to crack them open or do you eat them entirely with the shell on?? Hi Gisela, sorry to hear you had difficulty with this recipe! It is normal for them to pop in the oven. Maybe drying them out overnight dried them too much. 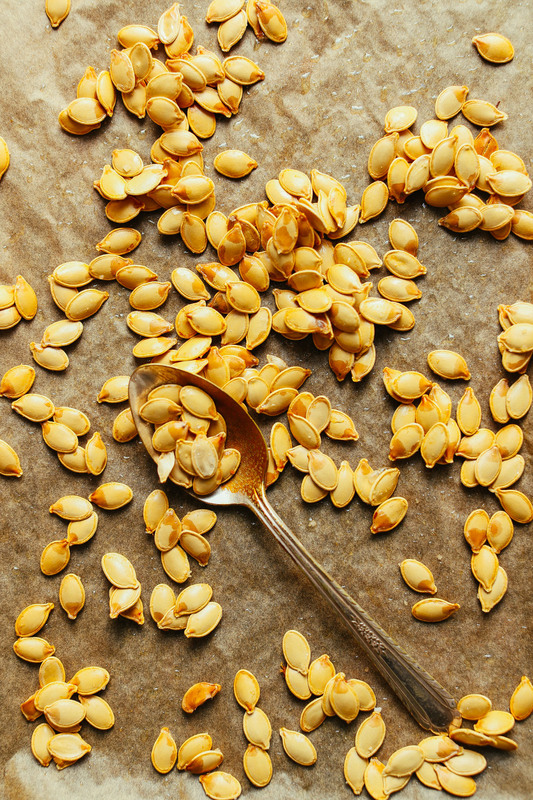 Naturally, they are a bit chewy or fibrous and are different than shelled roasted pumpkin seeds from the grocery store. They are intended to be eaten with the shell on. Hope that helps! All four of us liked these! We’re glad to hear that, Heidi! Yum! I was out of Avacado oil so used olive oil and sea salt. Will definitely use this recipe again. Thank you! I agree! Leave on the guts! Gives extra flavor taste delicious!